Almost every Saturday morning around 10 o’clock a lean, dark green Jaguar noses into the South Kensington traffic and heads west. The number plates bears the inscription FS2, the initials od the slight, dark haired man at the wheel. Frederick Starke, fashion designer, managing director and business tycoon, dressed now in comfortable tweeds, could at this moment pass equally well for a successful racehorse owner or a gentleman farmer. For the next twenty-four hours he will lead a slow-paced, country existence: swinging round the local golf course; outstretched before a leaping, log fire; talking to friends he has known for years. But at 9.30 on Monday morning he will manoeuvre his second Jaguar (registration number FS1) into the kerb outside his Mayfair salon. Seconds later he will be at his desk in the small cubby hole office above the glitteringly spacious salon where the dresses bearing his name are paraded before an assortment of home and overseas buyers. ‘I’m bad at getting up early,” he admits, “but once at the office I pack in quite a programme.” His “programme” is sufficiently high-pressure to make many other executives flinch. Above the clatter of half-a-dozen typewriters in the next office, he dictates letters, flicks the switches on his Hollywood-type Dictograph to give instructions to other departments, designs-and later fits- all of the garments for every collection, and generally see to it that his exacting target output of 5,000 Fredrica models a week comes up to scratch. This kind of pace is probably what it takes to stay abreast of the wholesale fashion industry. But Frederick Starke with a first-ever bronze award for ‘outstanding design”, is ahead of the field. The grandson of a fashion designer, he was, as he puts it, “born into the fashion business- but managed to avoid it up to the age of twenty-three.” Then his inborn talent, and a reluctantly admitted disinclination for any other profession, forced him into the design world. And in 1933. Frederick Starke Ltd., with bright, attractive premises at Little Portland Street in London, started and quickly became a going concern. In 1945, after the Allied forces had entered Berlin, Frederick Starke came home. While he has been away, an enemy bomb had shattered the Little Portland Street premises and his business has now moved to Bruton Street, in the shadow of Norman Hartnell’s famous salon. He immediately set about scoring a notable First. 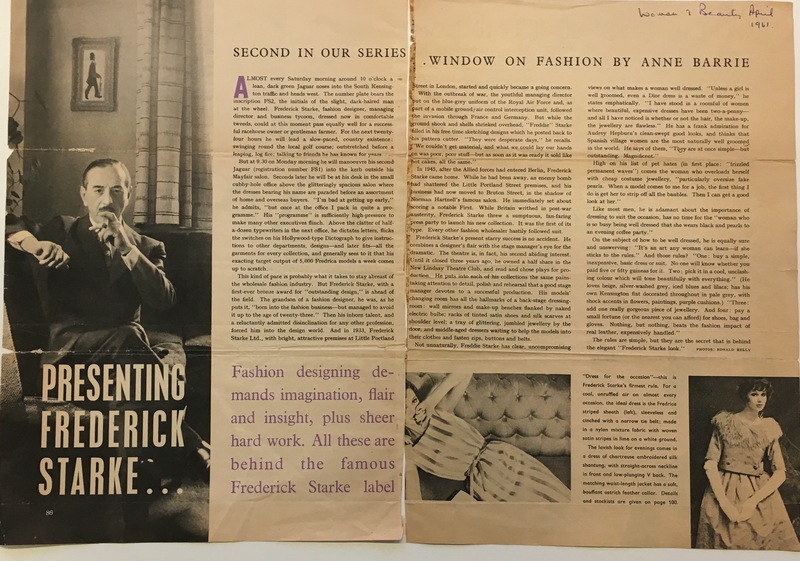 While Britain writhed in post-war austerity Frederick Starke threw a sumptuous, fan faring press party to launch his new collection. It was the first of its type. Every other fashion wholesaler hastily followed suit. Frederick Starke’s present starry success is no accident. He combines a designers’ flair with the stag manger’s eye for the dramatic. The theatre is, in fact, his second abiding interest. Until it closed three years ago, he owned a half share in the New Lindsay Theatre Club, and read and chose plays for production. He puts into each of his collections the same painstaking attention to detail, polish and rehearsal that a good stage manager devotes to a successful production. His models’ changing room has all the hallmarks of a back-stage dressing room: wall mirrors and make-up benches flanked y naked electric bulbs; racks of tinted satin shoes and silk scarves at shoulder level; a tray of glittering, jumbled jewellery by the door, and middle-aged dressers waiting to help the models into their clothes and fasten zips, buttons and belts. “Dress for the occasion”- this is Frederick Starke’s firmest rule. Fashion designing demands imagination, flair and insight, plus sheer hard work. All these are behind the famous Frederick Starke label.